Andrei Tarkovsky's debut feature, Ivan's Childhood, arrived at a crucial point in Soviet history. Released in 1962 amidst the cultural thaw instigated by Nikita Khrushchev several years earlier, the film represents the way in which Soviet political and cultural policy were so inextricably entwined. The Communist Party in the U.S.S.R. had always placed a strong emphasis on the power of images to shape reality. They felt that by showing people the idealistic socialist future in their propaganda, rather than the harsh realities that they actually faced, that future would eventually come into existence because the people would believe in it and work harder to make it real. In keeping with this, the Party maintained a stranglehold on the film industry, dictating both what kinds of films were being produced and what their content would be. This created a cinema of "socialist realism", in which films could not depict the world as it was, but the world as it should be. To paraphrase Armando Iannucci's In The Loop, as far as the Party was concerned cinema should not be a reductive record of what happened to be real, but a full record of what was intended to be real. This was particularly noticeable when it came to depicting the events of the Great Patriotic War (or World War II to the rest of the planet) because war films could only tell stories that fit the official narrative, which said that the war was a glorious success conducted by heroes of the people who were valiant, selfless ambassadors of Communism who triumphed over the barbaric fascists. The apotheosis of this idea is probably the 1945 film The Fall of Berlin, in which the war is not only depicted in the most positive light imaginable, but Stalin is shown to be the mastermind behind the success of the entire campaign. It's hagiographic to grotesquely comic proportions. Of course, this image of the war was not even remotely accurate. The Soviet troops were just as ruthless and barbaric as their Teutonic foes, perhaps moreso since by the time they got to really fight back against the Nazis they had a lot of atrocities to avenge. But that did not fit the narrative, and any film depicting that side of the war could not be made. This attitude was not unique to film, but was endemic to all aspects of Soviet life. In one of the most infamour examples, The Siege of Leningrad, which lasted 872 days and resulted in huge loss of life and destruction to one of the U.S.S.R.'s great cities, was expunged from the official history for years because the outbreaks of cannibalism and violence within the city were considered inappropriate and were ignored. After the death of Stalin in 1953, and Khrushchev's denunciation of him in his "Secret Speech" in 1956, that attitude changed. There was a thaw in Soviet politics and culture which allowed for multiple narratives to exist alongside the official one. As far as war films were concerned, it meant that the conflict could be depicted in a far more realistic and nuanced fashion, and a series of films that treated the war with the complexity and ambiguity that it warranted followed. Alongside the Palme d'Or-winning 1957 film The Cranes Are Flying and the Oscar-nominated 1959 film Ballad of a Soldier, Ivan's Childhood stands as one of the great examples of how the new found freedoms not only allowed directors to explore new, fertile subject matter, but create breathtaking works of cinema in the process. Using a nonlinear narrative, the film tells the story of Ivan (Nikolay Burlyaev) a twelve-year old boy who works as a scout for the Soviet Army. Ivan's job entails travelling into Nazi-occupied territory and bringing information back to the commanders in order to help them plan their manoeuvres. The film establishes very early on just how different it was to the films that preceded it. After narrowly avoiding being detected by Nazi sentries and swimming across a vast river to relay his information to the men at H.Q., Ivan is found and taken by Soviet troops who interrogate him in order to determine his identity. His repeated requests to speak to "Number 51" at H.Q. are met with distrust, if not outright disdain. The unthinking idealogues of The Fall of Berlin and its ilk would have taken the word of this child of the revolution without a moments hesitation, but these soldiers are distrustful, rude and sticklers for procedure. They are, in a word, human. Elsewhere, in a subplot that has little to do with Ivan's story but further illustrates the break with the old traditions, a young nurse named Masha (Valentina Malyavina) is the object of the amorous attention of a young soldier, who creepily hounds her despite her lack of interest in him. Whether their relationship is meant to be uncomfortable or I am just reading something into it that isn't there, the actions of the soldier are clearly meant to make a statement; these men don't just have socialism on their mind, they are real men with very real desires. They also have very real faults, and several supporting characters in the film display a callous attitude that ten years earlier would have been reserved solely for the fascists. Even though there is a clear delineation between who is good and who is evil, Tarkovsky treats the good guys with a degree of complexity that would have been positively treasonous under Stalin. Through flashbacks and dream sequences, we come to learn that Ivan joined the Army because his family were murdered by the Nazis. Here is another point at which Ivan's Childhood splits off from the Stalinist depictions of war; it states categorically that war is not glorious, but a psychologically devastating and destructive state which irrevocably alters anyone who experiences it. Though no deaths are depicted onscreen and what little violence there is is tastefully done, the film has an oppressively gloomy atmosphere that plays on the fears, doubts and ruminations of its characters. It also finds time to show the effects of war in a more tangible way. In one of the film's most shocking moments, the camera slowly pans across an empty stretch of beach before coming to rest on the mutilated bodies of two scouts the same age as Ivan, which have been made to sit up holding a "Welcome" sign. That brutality, even if it is only implied, and the effects that it would have on the soldiers who witness it, would have been unthinkable just a few years before. Fans of Tarkovsky's later works like Solaris and Stalker will be surprised by the speed and economy on display, as Tarkovsky keeps the story and the style relatively simple; there are few long, unbroken takes and little of the spirituality that would mark his later work. However, he brings to the story an undeniable vision and eye for composition that was already fully formed at such an early stage in his career. (Tarkovsky was only 30 when the film was released.) The black-and-white photography gives the film a moody, claustrophobic feeling that perfectly captures that sense of always being moments from death. His cast, lead by the spiky yet vulnerable Burlyaev, complement his vision with their boldly human performances, mixing duty, honour and bravery with fear, doubt and desperation. 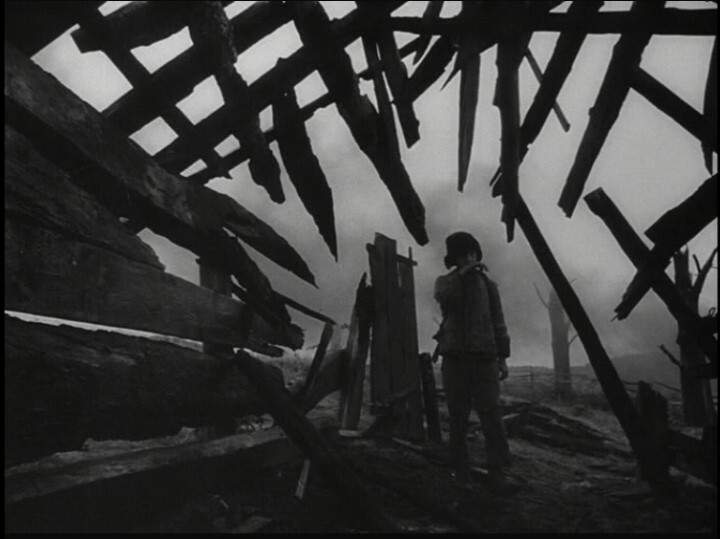 Out of context, Ivan's Childhood is a riveting film about the effects of war on ordinary people with a great central performance by Burlyaev and moody direction from Tarkovsky that makes it easy to see why Ingmar Bergman was a fan. As part of a cultural shift in the Soviet Union, it's an astounding example of an artist taking full advantage of new freedoms afforded them and creating something both of its time and truly timeless.